In 2014, a core group of swing dancers in the Dallas/Fort Worth Metroplex joined together out of a desire to improve as dancers and share the their love of swing dancing with others. With dancers residing in many cities around the metroplex, they felt it necessary to create a group that promoted the cohesion of multiple swing dance communities in the area. Interstate 35 often serves as a lifeline within the metroplex to help dancers travel from one community to another. 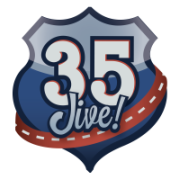 So, in combination with the vernacular jazz slang term "jive", the name 35 Jive surfaced. As a team, 35 Jive seeks to grow as dancers while inspiring and encouraging other local dancers on their own journeys. The team accomplishes this goal through performing and competing. Members of 35 Jive specialize in Lindy Hop, Charleston, and Solo Jazz, but many also demonstrate skill in Balboa, Collegiate Shag, St. Louis Shag, and Tap. If you would like to learn more about 35 Jive and how they can help you connect with the swing dance community, please complete the form by clicking on the contact button below and they will get in touch with you soon!